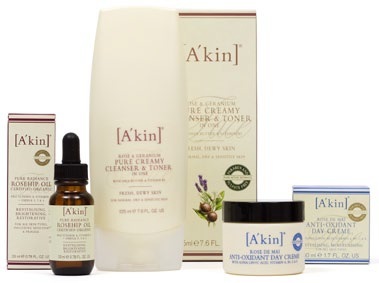 This week Pharmacy Daily has teamed up with A’kin and is giving five lucky readers the chance to win one of their luxurious skincare packs, valued at $90. Refresh and revitalise your skin with this beautiful prize pack containing three A’kin favourites, starting with Rose & Geranium Creamy Cleanser & Toner in One, followed by Rosehip Oil, and Rose de Mai Anti-Oxidant Day Creme. For your chance to win, be the first person to send in the correct answer to the daily question below. What are the benefits of A’kin Rosehip oil? Which company does A’kin belong to? True or False? A’kin products are vegan. Who would you recommend A’kin products to? Hint! Visit www.purist.com or www.facebook.com/akinbypurist.